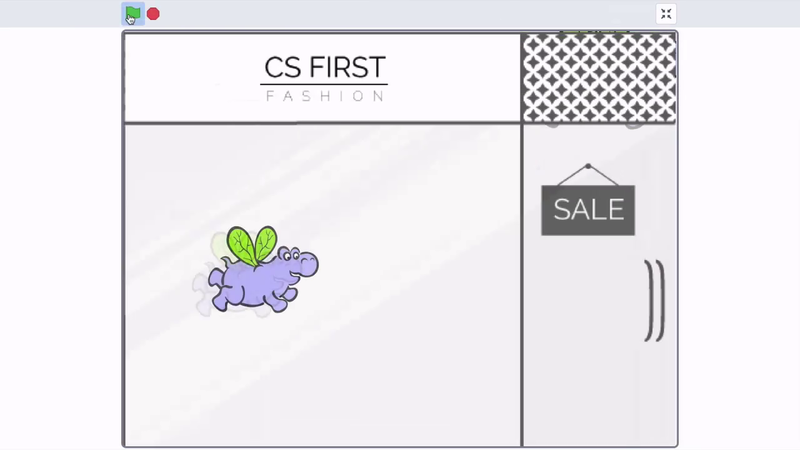 Welcome to day six of CS First Fashion and Design. Today you'll build an interactive store window as you learn about objects. In Scratch, an object is called a sprite. As an object, each sprite has different attributes you can modify, including things like its size and color. You can create multiple copies of an object using code. In each copy we'll have the same attributes as the original. For example, if you copy a sprite that says, Stop repeating everything that I say, its copy will say the same phrase. In Scratch, the process of copying objects is known as cloning. Today, you'll design your own storefront window using cloned objects, or sprites. Check out these examples: Designers create store window displays to grab the attention of people walking by. These displays use color, movement, and other effects, manipulated by code. Winning storefront displays are quite sophisticated in their use of technology. Some use eye-catching video content, while others incorporate interactive features that allow shoppers to change the contents of the window. Some interactive displays project images on the ground that react when the shoppers walk across them. When you design your interactive store display, you'll clone Scratch objects to fill your shop window. In this example, the window displays fills with hippos, that vary in size, and fly at different angles. After you finish watching this video, click the Window Shopper starter project link. and click the Remix button. Then, add a new sprite to your project. This sprite will move across your window display, so choose something that will grab the eye of potential customers walking by. Now it's your turn: Click the Window Shopper starter project link next to this video. And add a sprite from the sprite library. Add a sprite from the sprite library.